I did a few small changes to the 360 post to fix G73 not working correctly. The post was not passing the U param, which appeared to my eyes to make it just plunge drill. This works properly with the "chip breaking" selection and my drills are unclogged. Need Help!- Newest PP Fusion360 post. I've done a few other fixes since this. One in the soft tapping thread and another suggestion from the HSM forum which allows Work offsets G540-G599 (for Cent 6 and above). So I figured I would post that here in case anyone was interested. My old programming background is really handy right now. One more update - G88 now works across all tapping operations left and right and chip breaking. The post will also use G540-G599 if the machine configuration in Fusion has more than 6 work coordinates. This makes it work with both Cent 5 and Cent 6+ The previous use with 7+ did not work well and someone else helped me fix it up. Been looking for this, thank you! I had a question in regards to your settings. I have a partner 1H with centurioin V and when ramping into parts, be it thread milling with a single point tool or helical ramping into a pocket, the z axis feeds very hard into the part. I changed radius arcs setting in the post menu which works with thread milling with a single point tool. The only issue is this method is very slow and seems to dwell, which leaves tool marks on the parts. Do you have suggested post setting that you find works? Normal helical pockets in an adaptive or pocket are controlled from the ramping angle in the Linking tab of the operation. You can set this as heavy or as light as you want. I haven't done any thread milling yet sorry. Ok, it isnt a ramping issue, its a post issue i believe. My machine wont ramp proper is the issue, what it does is goes into the ramping cycle, interpolated x and y in circular motion the minus z's fairly rapid at .04". Almost like a plunge into the part while ramping is the only way i can describe it. Also, is your post here good? Thought it was working but seeing your other posts now I dont know if its causing you issues. I have been having the same threading issues as you. No post will start the thread cycle, it just dwells over the part. with thread milling it goes around the part in xy and then stops, feeds in z and then goes around again. The machine seems like its lacking something, like maybe I dont have a feature enabled or a setting right on the post. My problems are with a 26 year old machine being old. You would need to post a sample section of the code thats being output for any troubleshooting to occur. 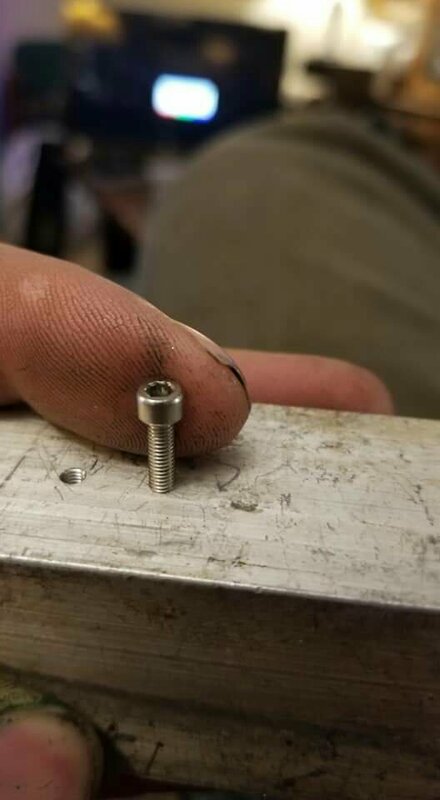 I have not threadmilled on the milltronics. Hopefully someone has an example of something working. I have been playing with thread milling on my vm16 through fusion. I'm rather glad it was suggested. I started with 1/2-13, then tried 1/2npt. Then to prove I could do it I acquired a small cutter and did m3-0.5. here is a working gcode for my cent5 vm16 machine generated from fusion to test thread milling a 1/2-13 thread. It bores the hole first rather than drills it because my drill chuck was already setup fr a different job. It then makes 4 passes and a spring pass. The X/Y/Z 0 points are the hole center top of the stock. 1. Under the linking tab check the box labeled lead in/out from center. If you dont it will be close to the wall and impact. I was glad I started playing in wax first. I don't know if anyone else has the MP4 tool probe on their milltronics Partner 1, but I am working on building logic to do automatic tool breakage detection simply by checking the "break control" checkbox in the Fusion tool setup or by commanding a Manual NC Break Control. Still some work to be done, it's not just a copy and paste affair. I have the macro one-liner being output, but it still needs some safeties programmed specific to the quirks of the cent 5 control and the existing post. I've been doing extensive post building for my HAAS machines and KIA lathe, so I'm trying to unify the code and functionality as much as possible between all 4 machines. My post also includes ProShop ERP tool management data on all machines, so before I release this I will need to remove that or at least toss it in the post config dropdown list. FWIW re: the above conversation, I have thread milled straight out of fusion using one of the above linked post versions. Did a 1/2 NPT thread actually! Worked great, no problems. Same with helical ramping and such, not a problem in sight so far (well, except the .0005 of intermittent Z and Y oscillation that I haven't bothered to figure out yet). Haven't tried tapping yet- I don't have rigid tapping on my machine, and I use my FlexArm for everything anyway.